Enjoying a late night set at the Bluebird Cafe is one of Nashville’s quintessential music experiences. And I was lucky to do just that on this past Saturday. This was my second visit to the Bluebird, and I’m happy to report that the intimate experience of sitting within two feet of Danny Flowers on my first visit was not a fluke. My second visit was just as memorable, as I enjoyed the works of Craig Carothers, Pete Wasner, Jesse Terry and Tony Haselden – four of Nashville’s pre-eminent song writers. The writers took turns preforming their work in the round; and although they had never played together before, the chemistry was there from the get-go. I attribute that to the mutual respect and admiration they all had for each other; and to the fact that they are consummate professionals. But to understand my experience, you have to understand a little bit about the Bluebird. Founded by Amy Kurland in 1982, the Bluebird has just 20 tables available for reservations, and holds the reputation of being “Nashville’s listening room. ”A typical night includes a performance by four songwriters in the round. They are seated in the center of the room, and not only do they play their songs, but they also elaborate on the backstories behind their tunes. By the time the set is complete, you feel like you personally know each songwriter. That’s the magic of the Bluebird. 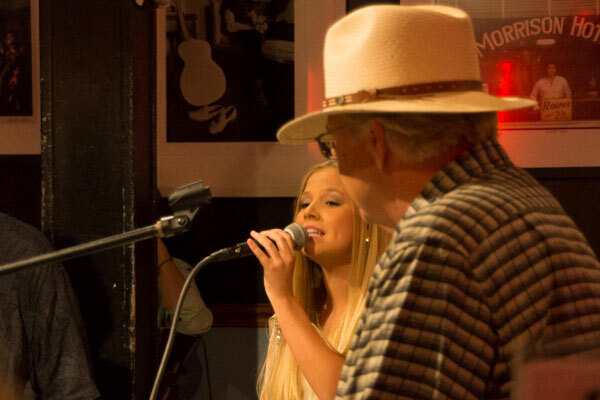 Mackenzie Wasner at the Bluebird, as proud papa looks on. You never know who you will see at the Bluebird; and in many cases you may be treated to a performance of a rising star. Garth Brooks played there before he was discovered, and Taylor Swift’s 2004 performance led to her success and subsequent partnership with Scott Borchetta and Big Machine Records. And I kind of felt like I was witnessing history in the making on Saturday, when Wasner invited his daughter Mackenzie up to sing a few songs. In short, she stole the show. We will definitely be hearing good things about her in the future, as the young lady definitely has a set of pipes on her. That said, reservations are hard to come by at the Bluebird, but with a little persistence you can score a ticket. Reservations are only available on the Bluebird website on the Monday prior to the weekend (Friday or Saturday) performances. Reservations open up at 8 AM, and they sell out quickly, so plan ahead. Although the venue is small, it does have ramp access, and with advance notice they can seat you at an accessible table. That said, the space is very tight, so be prepared to remain at your table for the duration of the set. As a writer, I also have to give a big shout out to the Bluebird management, as the door (usually a $12 cover) goes to the artists who preform. It’s good to see that the folks who create the magic also get compensated for it – which isn’t always the case in Nashville, or in life. 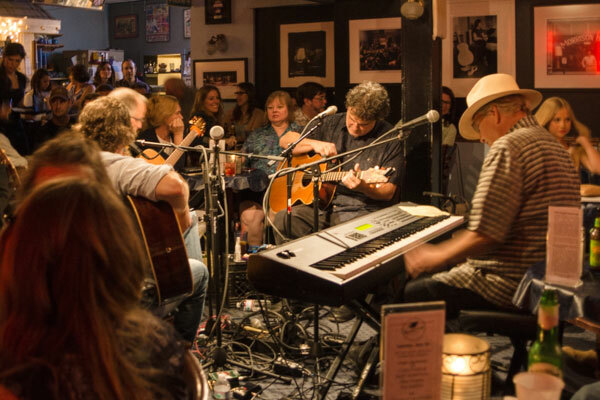 So put the Bluebird Cafe on your Nashville must-do list. I guarantee you won’t be disappointed! This entry was posted in Attractions and tagged attractions, Bluebird, music, music city, Nashville, slow walkers, wheelchair, wheelchair-users by Candy B. Harrington. Bookmark the permalink.